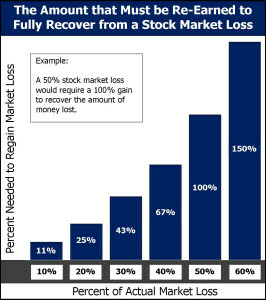 Can you recover from stock market losses? That depends on what context you use the word recover. Most people do not realize how much time and money it can take to recover from a steep market dive such as those experienced from 2000 – 2002 and 2007 – 2009. The S&P 500 stock index lost an estimated buy viagra online canada with mastercard http://carughi.com/portfolio/remodelacion-directorio/ 46% of its value from its highest point to its lowest point from 2000 – 2002. From its highest point in October 2007 to its lowest point in March 2009, the S&P 500 stock index lost an estimated 59% of its value. I hope to provide some context to this vitally important issue. Let’s say you had $100,000 in an investment account and your investment experienced a -25% rate of return over the most recently completed year. What rate of return would you need to earn the following year to get back to the $100,000 account value you started with? If you’re like most people you answered 25%. However, that would be incorrect. The reason that is incorrect is because the 25% gain would be on the new account value of $75,000 ($100,000 – 25%), which is $18,750 ($75,000 x 25%), for a total account value of $93,750 ($75,000 + $18,750). You are attempting to replace the $25,000 you lost and that would require a gain of 33.33% of $75,000, which is $25,000 ($75,000 x 33.33%), to achieve an account value of $100,000. The money side of the equation says you lost $25,000 and you need to gain $25,000. The math side of the equation says you lost 25%, but you need to gain 33.33% to get back to where you started. The numbers look much worse the greater the loss you are attempting to recover from. For example, if you lost 50% of your $100,000 investment you would have $50,000 ($100,000 – 50%). 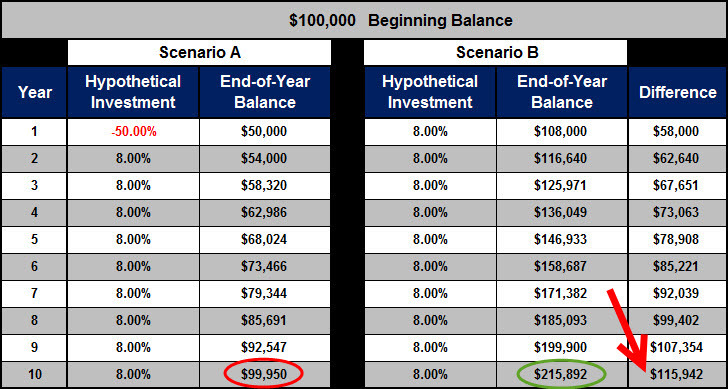 You would need a 100% rate of return to get back to your $100,000 ($50,000 x 100% = $50,000 + $50,000 = $100,000). You may be thinking, “Well, I don’t have to earn it all back in one year, so I’ll be fine.” However, the truth is you don’t have time. Not only can’t you afford to lose the money, you can’t afford to lose the time it takes to earn back the amount you lost. 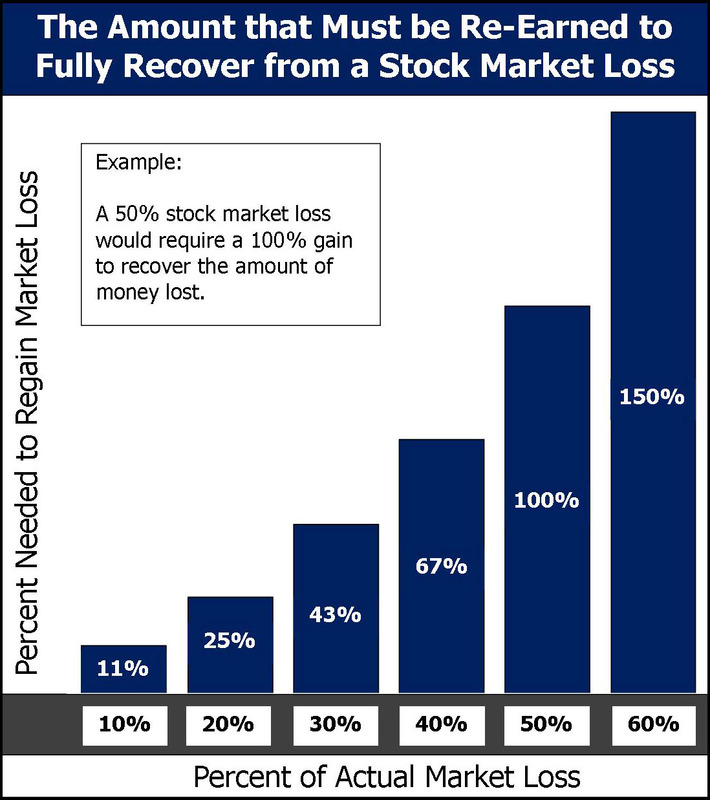 To truly recover from a market loss you not only have to recover what you lost, but the interest you would have earned had you not lost the money in the first place. If your investment account suffers a 25% loss, at an annual 8% growth rate, it would take four years to make up your lost $25,000. However, while your account value is back to $102,037, the account value would be $146,933 if you hadn’t suffered the loss. That’s an additional loss of $44,896. If your investment account suffers a 50% loss, at an 8% annual growth rate, it would take nine years to make up your lost $50,000. Again, that is just to replace the money you lost. That doesn’t even touch the $115,942 in interest you lost. You have to assume that if you can earn an 8.0% rate of return to recover what you lost that you can also earn that same rate of return on the money had you not suffered the loss. I realize how uncomfortable and disconcerting this information can be. However, I believe it is important to know the damage the Wall Street casino is doing to your wealth-building efforts. If you’re interested in learning more about how to eliminate the losses in your financial profile please contact us to schedule a time to talk.